Mama Style // Bringing Back an Old Favorite. As a style and vintage junkie, I love dressing up. 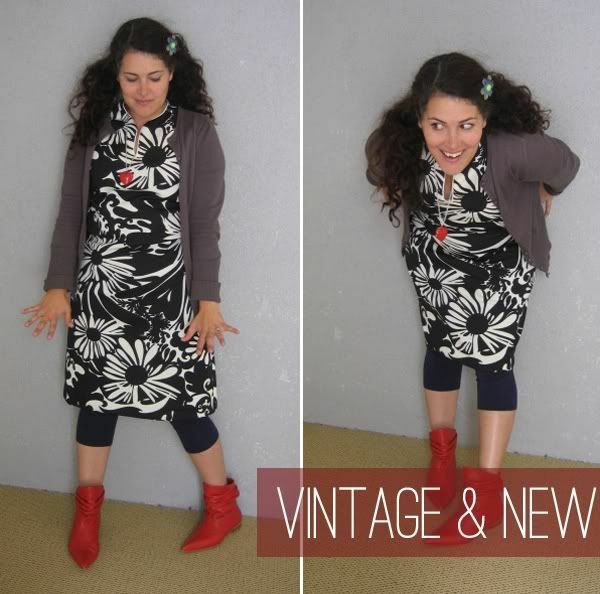 For years I was a vintage seller and member of the Wardrobe Remix group on Flickr. 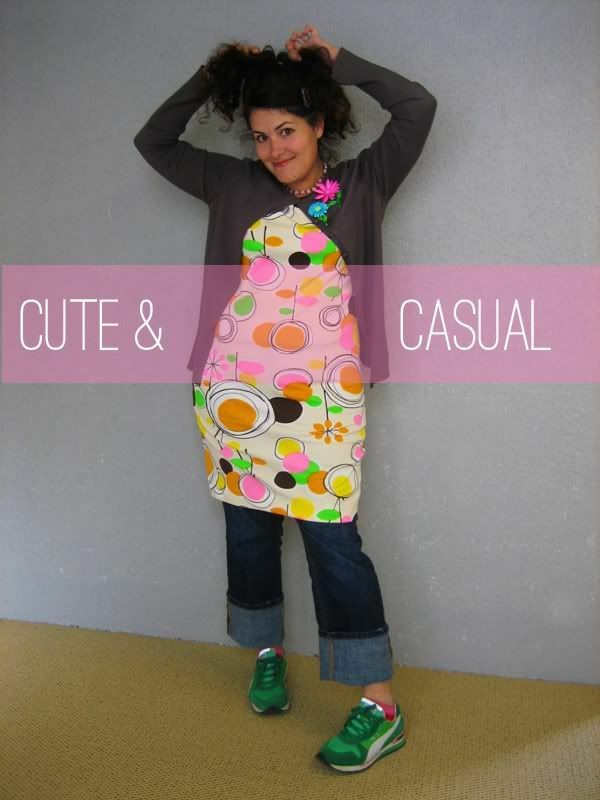 Then when I started my old blog, Strawberry Lemonade, “What I Wore” was a regular feature that everyone seemed to like (and I had a lot of fun doing!). I’ve done several outfit posts here on Modern Kiddo, and people have said they’d like to see more, sooooo I’m thinking of making it a regular feature again! We talk so much about kiddo style here, it only seems fair to give mama fashion a little nod too! 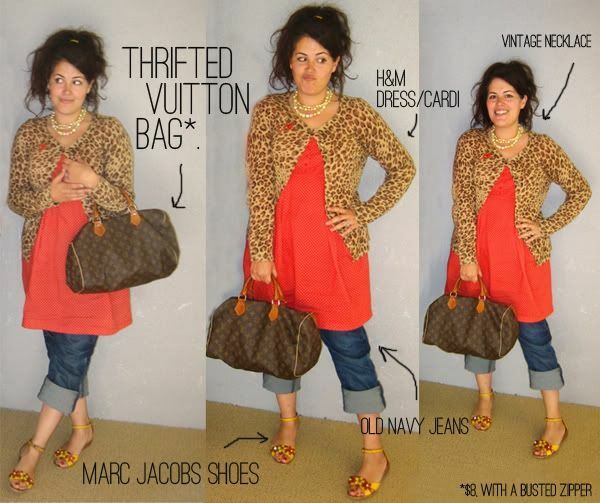 I’m by no means a svelte, leggy fashion blogger…I’m just a girlie who loves clothes and vintage. My style has always been a mix of “high” and “low”. I adore vintage, love pretty modern looks and can’t resist a good bargain. Before I married Greg and before I had Wolfie, I was a sassy singleton who spent FAR too much money on shoes (marc jacobs and miu miu where a particular weakness). These days I rarely splurge, and I swear over half my wardrobe comes from Target, but old habits die hard so sometimes you’ll see some high rollin’ brands in the mix. I think the one thing I have mastered since becoming a mama is not sacrificing comfort for style. Trust me, I have modified my wardrobe quite a bit—and I def have days where I just throw on jeans and sneaks—but I always like to feel just a little sassy. Sometimes it works….sometimes not so much. It’s all about experimenting and having fun! Also keep in mind, I don’t have a baby any more, which gives me more flexibility. When Wolfie was still a baby I couldn’t wear dresses (unless I wanted to pull the whole dang thang over my head while nursing) and I rarely wore necklaces or pins—I didn’t want him to hurt himself on a pokey pin or break a necklace. At the same time I have also totally gained weight since having a child and have a lil buddha belly to content with… so finding creative ways to hide it are also always a concern! I think this will be fun! I’ll be sure to let you know where I bought things. And don’t worry, I won’t be writin’ on all the photos all the time. That was just for this post. hee….they are the best sandals ever. they came in blue and green too, we will have to find you some so we can be twinsy’s! I really love your style! The second outfit is my absolute favorite. SO cute. I wish I could find some dresses like that! I’ll keep my eye open lady! I miss you Miss P……I was looking at the photos as I posted and was thinking, “Wow, it’s actually not that colorful!! I have a bunch of black and white ensembles up there…Pilgrim will be disappointed!” hee! Oh phew! I’m so glad! Sometimes you think, “Is this awfully vain of me to think anyone gives a flip about what I’m wearing?? ?” hahaha. Aw, you’re adorable!!! Love it! Your style is very inspirational!! 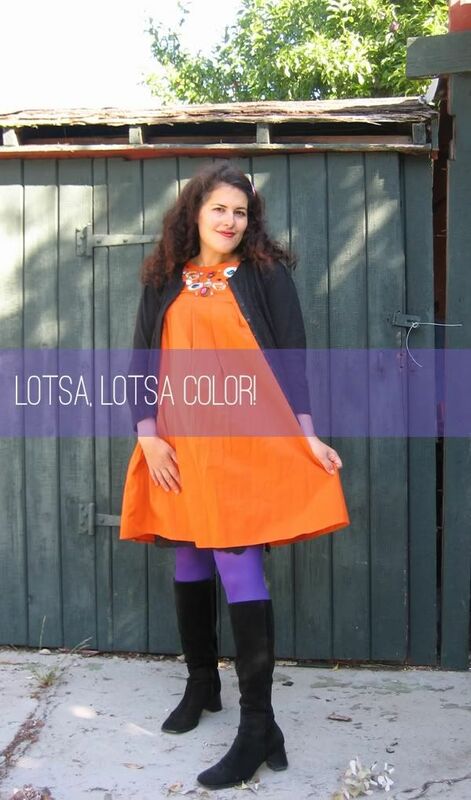 I love how you mix fun colors together—-I am going to try to break out of my monochromatic rut. Keep on sharing!!! Love your pumas!! Aw geez, thank you! That’s so sweet of you to say. I will have lots of color-loving tips…..I know not everyone is as color crazy as me, so I love finding ways for people to bring just a WEE bit more! At one point do I become a single white female? YES!!!! 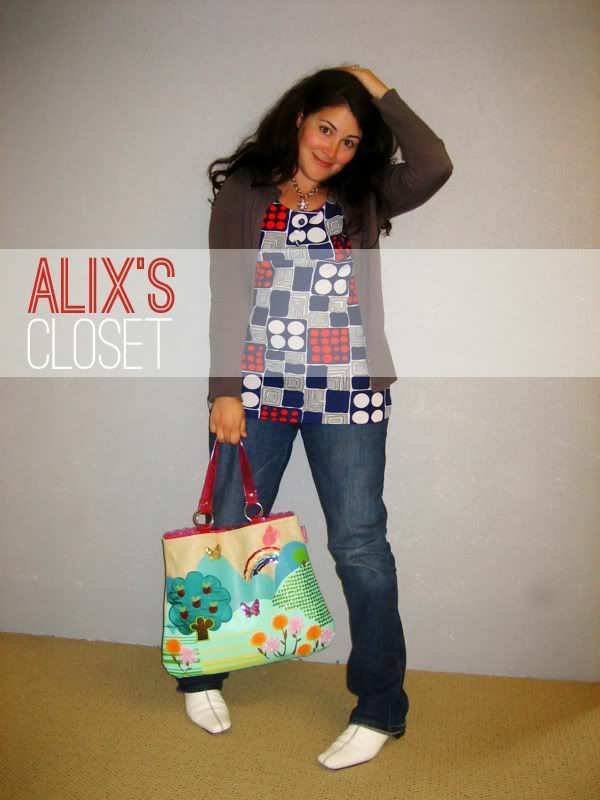 I love me some Alix’s closet and all the magic it holds! I love the green kicks! MUST. HAVE. TJ MAXX baby! Wolfie actually picked them out for me when he was 3 or 4! You are an inspiration, my gorgeous friend! *MWUAH!! * we need a ya-ya night my friend!! yahoo! I always love your fashion sense – it’s funny, I’ve been thinking of doing some more mom-focused posts on my blog too, can’t decide yet. But either way, I’m in agreement – COLOR RULES. i just freakin’ love you. i bet you ANYTHING that if you came to see me here 99% of the people would ask if we are sisters, as long as i get out of the yogas for the day of course! lol! the dress over jeans is my fave look ever. We we DO have matching bellies…..alas, I’m not carrying a sweet little Tova, I just have a baby burrito in there!!!!! Lishy someday we WILL meet!!! YES!!!! Make this a regular. LOVE your mad style. You’ve got moxie girl. Jenny I pinkie swear a sale will come. I’m such a lame-o!!!! Now that summer is over (which was when I was supposed to have a sale) I can get crackin!!! i need you to live in my house and dress me every morning. that sounds weird. maybe pick out clothes and i would dress myself. i am FAAAAAR from being a sassy dresser these days. YESSSSSSSSSSSSSSSSSSSSSSSSS!!!! This excites me like you wouldn’t BELIEVE!! !